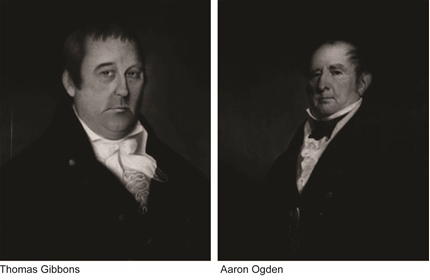 Key Facts– Ogden was licensed by someone with a monopoly on steamboat operation in New York with the right to operate a ferry between New York City and New Jersey. When Gibbons opened a competing service with a federal license, Ogden sued for an injunction. Procedural History– Ogden won in the New York state courts, but the Supreme Court granted certiorari. Issues– What does “commerce,” which the federal government can regulate, constitute? Does this power of regulation have limitations? Holding– Commerce power constitutes power to regulate anything involving commerce between or involving more than one states, or the United States as a whole. Essentially, it is unlimited. Reasoning– The Constitution gives Congress broad powers to regulate commerce that connects or involves more than one state, and Congress has been doing just that for years without any hint of objection from anyone, by this point. National Labor Relations Board v Jones & Laughlin Steel Corp.